Extremely inexpensive option—create your own allergy or name labels out of return address labels; you can even find one that takes a picture and change the address lines to read info like name, allergies, ICE contact. You can also order some in plain colors and just list child’s name (even can make it larger font and center it). Not as skinny as other name labels and not waterproof, but for this low price you can order enough to cover relabeling. Great for use on paperwork for nurses and teachers and for single use like cups at parties/snacks for the day etc. Nice but very pricey allergy labels or photo labels. Least expensive alternative; generic medical allergy labels, though you’ll have to list the allergens by hand yourself and are probably not waterproof. Also great for pantry stickers (allergy alert). Sell great ‘stop please don’t feed me’ stickers and pins and bibs for those who can’t yet speak or understand their allergies. The best way to stay in the loop and communicate with the members of our community is by subscribing to our free email newsgroup. 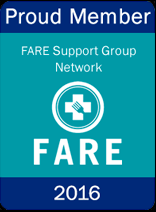 This website was made possible through a community grant from Food Allergy Research & Education (FARE). Click here to join our free email newsgroup.